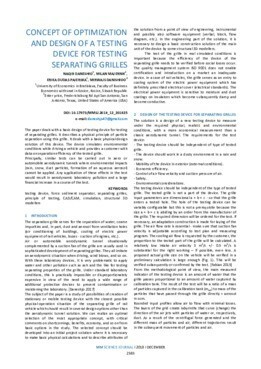 The paper deals with a basic design of testing device for testing of separating grilles. It describes a physical principle of particle separation using this grille. It deals with a basic physical-design solution of this device. The device simulates environmental conditions while driving a vehicle and provides a customer with data on separation efficiency of the tested grille. Principally, similar tests can be carried out in aero or automobile aerodynamic tunnels where environmental impacts (rain, snow, dust particles, formation of an aqueous aerosol) cannot be applied. Any application of these effects in the test would result in aerodynamic laboratory pollution and a large financial increase in a course of the test.